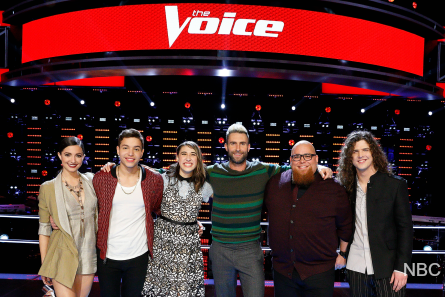 The coaches’ teams for season 12 of “The Voice” are finally upon the finish of the last night of Knockout Rounds. 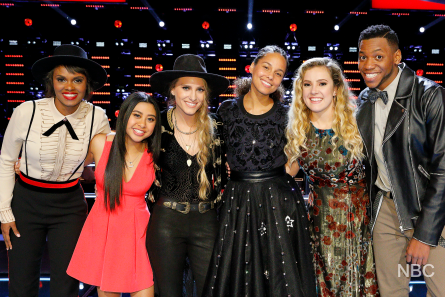 One more surprise steal was in store and this season’s contenders have proven to be made-up of some really powerful, unique voices. Perhaps more so than any other season. 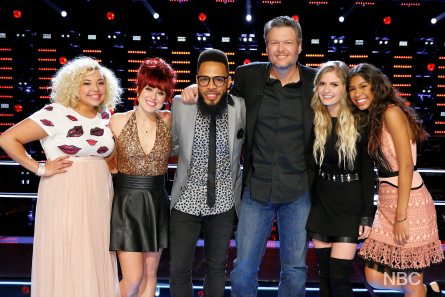 Team Blake’s Aliyah Moulden proved that she can sing a grown-up song convincingly, Jesse Larson from Team Adam blew-up the stage with a classic song, and Team Gwen’s J Chosen stepped-it up to show that he’s the real deal. 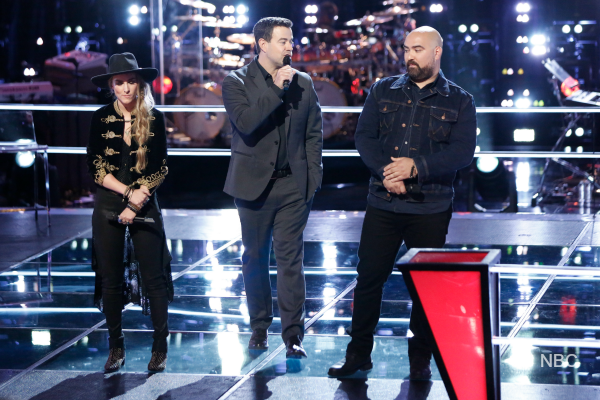 Plus, there was one female vocalist who several of the coaches labeled as a sure bet to win this season. Alicia said Andrea was singing more than feeling and Lauren was feeling more than singing. Adam credited Blake for “finding that diamond in the rough.” He went with Lauren. 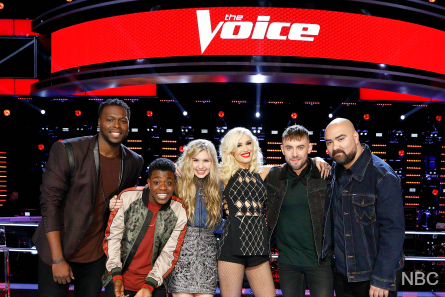 Blake said it’s good that Andrea is “stepping out from the background,” (referring to her singing background). Blake said Lauren is “bashful,” and “it’s Lauren”. KNOCKOUT WINNER: Lauren. Blake chose Lauren because “you listen to Lauren sing and there’s no way you feel nothing.” He said that’s what he needs going into the live shows. Although Jack comes from a musical family (The Partridge Family) and started by learning the piano, Vanessa has more experience. Jack sang “Unsteady” while playing the piano. Vanessa sang “If I Were Your Woman”, also playing the piano. Gwen said Vanessa knocked her out. Adam noticed a struggle with Jack’s voice. Jack said it was an emotional song for him. Adam chose Vanessa. Blake said Jack got lost in a good way. The way you want a performer to get lost in a performance. However, “saying that Vanessa was phenomenal was like saying water is wet,” said Blake. Coach Alicia said they haven’t seen the best of Jack yet. KNOCKOUT WINNER: Vanessa. Alicia chose her because Vanessa has such an incredible style about her. “She just slayed it”. Alicia thinks Vanessa will impress America. Both Blake and Adam said Vanessa could win. Davina called losing her battle “a blessing in disguise.” She got stolen by Adam and said he’s inspiring. Davina picked “Toxic” by Britney Spears to sing and flip. Jesse chose “The Letter” and said he’d be thinking about his wife because he misses her. Jesse blew it out of the water! Blake responded “what a great time to burn the house down. You just sang the crap out of that song!” Alicia said she LOVED how Davina decomposed “Toxic.” She said Jesse could take a little from Davina. Alicia said Jesse was smacking them around. Gwen agreed and called what he did “magical.” Adam said “like a wizard.” Adam said it takes courage to be subdued like Davina. He compared Jesse to Cee Lo Green. KNOCKOUT WINNER: Jesse. Adam was excited about Jesse and said he has soul, a lot of power and a lot of range. Adam predicted that Jesse will kill on the live shows. Team Adam’s MALIK DAVAGE vs. MARK ISAIAH Knockout Round was briefly shown. Mark sang Justin Bieber’s “Love Yourself” and won the Knockout. Adam predicted that he will get millions of fans every night (during the lives). Gwen paired Brandon and J Chosen because at the end of the day, she only needs one R&B singer to focus on. Unfortunately, J’s mom had a stroke. He chose “Without You” song because it speaks to him and dedicated it to his mom. Brandon was intimidated by J’s “top tier”. To pay homage to his hero Bob Marley, Brandon sang “Redemption Song”. 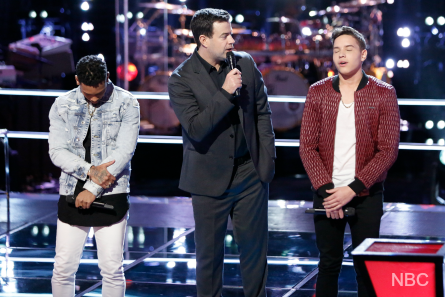 Adam, who was still sour that J didn’t choose him as a coach, said J Chosen “crushed it’ and has been “dazzling” him from the beginning. Blake said Brandon is one of his favorites. 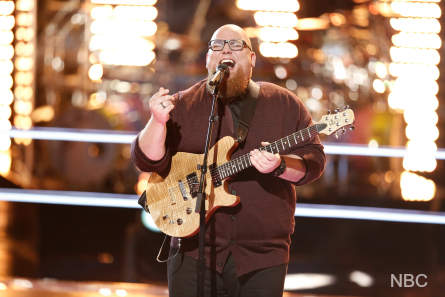 But, J Chosen saw it as a Knockout Round and nailed the song. 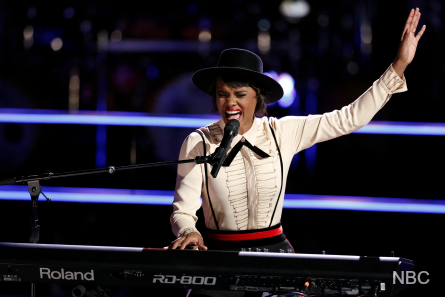 Alicia loved how Brandon sang the song. She said J Chosen was pure and “cut through.” Coach Gwen said Brandon took the song to “a younger place.” She credited J for having a lot of courage for performing through his tough time. KNOCKOUT WINNER: J Chosen. Gwen said she’s going to help J realize how good he is. Aliyah and Caroline are two of Blake’s young singers. 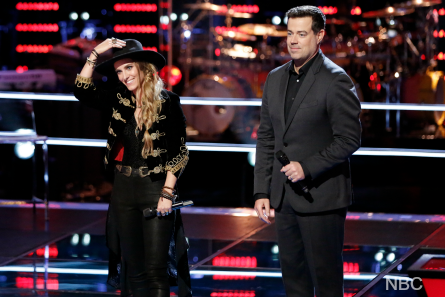 Caroline was first on Team Gwen, but was stolen by Blake. She chose “At Last”, a song she learned to play on guitar at nine-years-old. Aliyah chose “Before He Cheats” song. Alicia said Caroline’s voice really lends itself for that song. The coaches said “Before He Cheats” was an old song for Aliyah. But, Gwen said it shows the mature side of Aliyah’s voice. Gwen chose Caroline. Adam said Aliyah ensured that no man will ever cheat on her and her doing Country “is pretty amazing.” He chose Aliyah. Coach Blake said their performances didn’t make it easy for him. “Caroline is capable of doing whatever. She’s that talented,” he said. It was Aliyah’s first Country song. He called Aliyah’s performance her best yet. KNOCKOUT WINNER: Aliyah. Blake said it will be a fun journey to figure out who Aliyah wants to be as an artist. Stephanie sang “Safe & Sound.” She said it’s her singing to herself at 18-years-old. Stephanie was rejected by her family after coming out of the closet. Troy was a 4-chair-turn. Troy chose “Chandelier” song by Sia to sing. Adam called Stephanie’s voice “interesting”. Maybe Troy wasn’t as impactful but that doesn’t mean he’d let go of him. Blake called them really intense performers who are in two different lanes. Vocally, Blake gave it to Troy. Alicia said every time Stephanie opens her mouth truth comes out. She said Troy had balls for singing Sia’s “Chandelier.” Gwen said she relates to both of them in different ways. Troy is emotional, with a big range. She said there’s more of him that she hasn’t seen yet. KNOCKOUT WINNER: Troy. STEAL: Alicia stole Stephanie at the last minute.